Giovanni Paolo Panini trained as a set designer in his native city of Piacenza with Giuseppe Natali and Andrea Galluzzi, and later with Francesco Galli-Bibiena. He continued his training in Rome where he is documented in 1711, focusing at this point on painting figures, which he perfected with the history painter Benedetto Luti, and on decorative painting and landscape, which he studied with Andrea Locatelli. His early years would be particularly important for his later choice of subject matter, and Panini worked both in fresco painting (in which he executed his earliest commissions) and oil. Among the subjects painted by the artist were views of Rome, capriccios and elaborate ceremonial events as well as a series of commemorative paintings that depicted important moments in the life of Rome. His religious compositions are also located in splendid settings that recall set designs or perspectival studies and the present two works are of this type. These two canvases depict New Testament scenes. They entered the Thyssen-Bornemisza collection from the art market in 1976, having previously been in a private collection in Milan, but little is known of their earlier history. They were displayed at Daylesford House, the residence of Baron and Baroness Thyssen in the UK, where they were the subject of a commentary by Eric Young in 1983. Just prior to their acquisition they had also been the subject of a report by Ferdinando Arisi. Both canvases are signed by Panini with their place of execution, while The Expulsion of the Money-changers is also dated, to which Panini also added “Piacentino”, alluding to his place of origin. 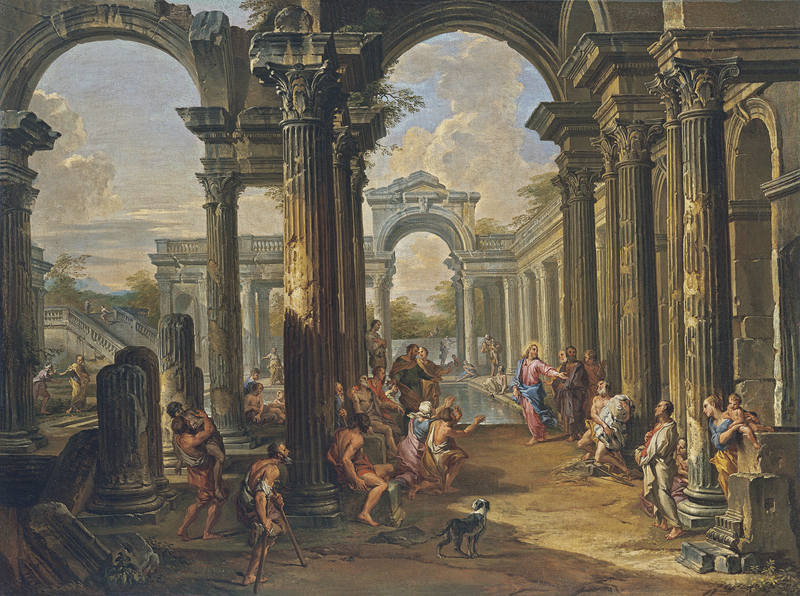 The date of 1724 is generally also accepted for the other composition depicting The Pool at Bethesda. These two subjects were popular within Panini’s oeuvre and he repeated them throughout his career, producing works of great beauty. In The Expulsion of the Money-changers the artist locates the scene in a large portico at the entrance to a temple. Christ, at the top of the entrance steps, stands out due to the bright blue and pink tones of his clothes as well as his glowing halo. The money-changers are arranged in small groups with their goods including the one leading sheep and cattle at the lower left corner, another standing at the foot of the stairs who rapidly gathers up his possessions to flee from the enraged Christ, and the one on the right, holding onto two sheep. The figures and some details are considered to reflect the influence of Benedetto Luti. 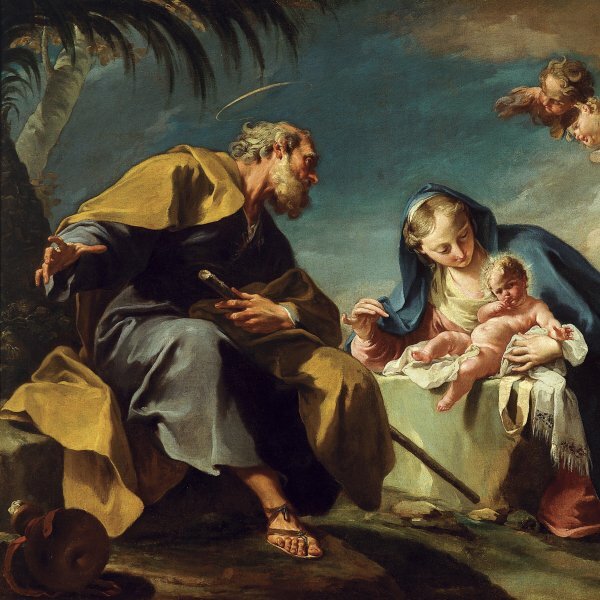 Among the known versions of this composition are the canvas in the Museo Nacional del Prado and one in Munich. The most important example, however, is the painting in the Galleria del Collegio Alberoni in Piacenza, commissioned by Cardinal Giulio Alberoni, one of Panini’s patrons. The Pool at Bethesda narrates Christ’s miracle as recounted in the Gospel of Saint John. Panini sets it in a more complex setting in which the central pool is framed on three sides by a tall Corinthian portico with a broad flight of steps on the fourth side. Christ again wears pink and blue and stands out due to the bright colours of his clothes and his bold, dramatic pose among the figures of the sick and others who accompany them to the healing pool. Of the other known versions of this composition the finest are the ones in the Canessa collection in Rome, in the Staatsgemäldesammlungen in Munich in which the architecture forms a circular area behind the pool in the foreground, and the one in the collection of Norbert Pokotta. The latter has a pyramid that closes the composition on the left side of the pool.